(Nanowerk News) Scientists at the LCN have shown a new way of reading electron spins, which eliminates the need for powerful magnetic fields and reduces the reliance on very low temperatures. The study is published in the journal Nature Materials ("Hybrid optical–electrical detection of donor electron spins with bound excitons in silicon"). One of the fundamental properties of subatomic particles is their ‘spin’, a form of angular momentum associated with these particles. Several quantum technologies rely on the orientation of these spins. One particularly promising approach is by embedding impurity atoms in a wafer of silicon, then encoding information in the spin of its nucleus or associated electron. This can be used to store quantum information, or as a sensor in quantum sensing devices that can carry out tasks such as determining the elemental composition of molecules. However, detecting the orientation of these spins is not straightforward. The team’s solution is to use a laser to help read the electron spins. Silicon is the raw material of computer chips, thanks to its peculiar electrical properties. The team used a wafer of silicon with phosphorus impurities, which provides an extra electron, whose spin is to be measured. 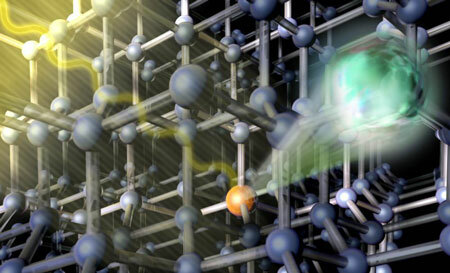 When a silicon lattice is bombarded with light from a laser, it creates ‘bound excitons’, where an extra pair of electron and hole sits at the site of the phosphorus impurity. When these electron-hole pairs combine together, they release energy that kicks the remaining electron out of the impurity altogether. This does not directly allow the spin to be measured – the only thing that can be detected is that an electron has been released, producing a tiny electrical current. However, the light can be tuned in a way which creates a bound exciton which selects which spin of electron to eject. Since the mechanism works entirely thanks to the energy coming from the laser light, the experiment can be carried out with little or no magnetic field. This in turn allows electron spins to be measured in environments in which magnetic fields would be problematic, something which was not possible until now.